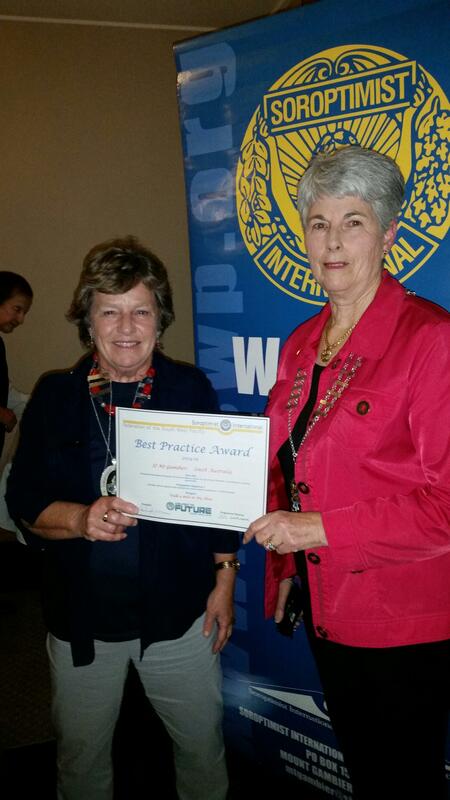 Soroptimist International have been active in Mount Gambier for the past 38 years with the club chartered on 26th November 1977. Mount Gambier is the second largest city in rural South Australia, situated on the traditional lands of the Boandik people, on the beautiful Limestone Coast, halfway between Adelaide and Melbourne. Soroptimist International Mount Gambier celebrated 40 years since it received its Charter in November 2017 with an Anniversary Luncheon at the Mount Gambier City Hall on November 25th. 2017. Soroptimist International Mount Gambier President Christine Plunkett and members Virginia Hill and Nicola speak out about the loss of Community Legal Services in Mount Gambier. Domestic Violence will be put at serious risk once the South East Community Legal Services closes its doors according to local Soroptimist International members. 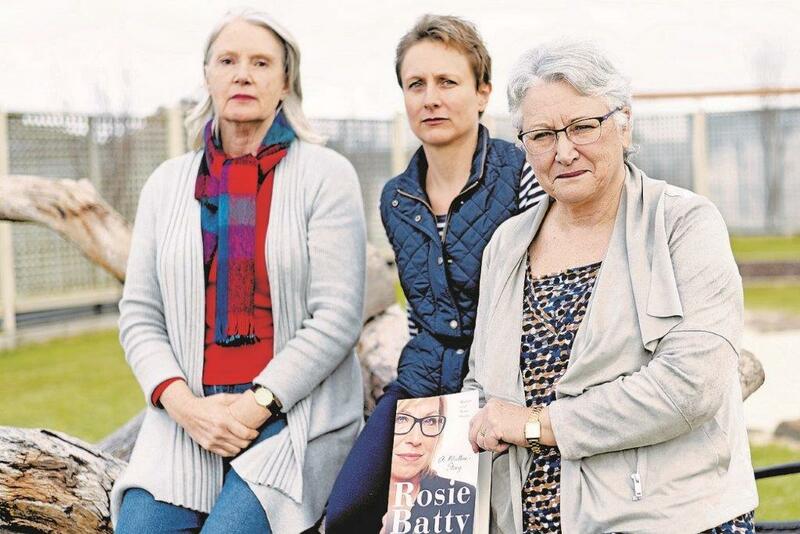 After joining together to support Rosie Batty’s campaign to lobby Prime Minister Malcolm Turnbull to reinstate federal funding for community legal services throughout Australia earlier this year, president Christine Plunkett was devastated to hear of the latest development. On April 24th we were elated to learn that a considerable amount of the money that was to have been discontinued was re-instated, now we find that our State Government is failing to pass these funds onto regional communities, she said. Writing to both Premier Jay Weatherill and Attorney General John Rau on behalf of the group, Ms Plunkett they are desperately hoping there will be a change of decision. The South East Junction Mental Health Activity and Resource Centre and Soroptmist Internatinal Mount Gambier have united to stand against domestic violence at the 2018 Commonwealth Games in the Gold Coast. A banner filled with ribbons in the shape of stars created from groups across the nation will fly high at the event promoting the end to all forms of violence and demonstrate a more peaceful society. The Mount Gambier Soroptimist group provided the ribbons and the South East Junction members, families and friends helped create the colourful stars. "Walking Away: Limestone Coast Family Violence Action Group Chairperson, Le-AnneThomson, calling on SE Domestic violence survivors to anonymously share their stories" Photo used with the kind permission of the Border Watch. The next stage project in 2015 was the publication of a booklet by Zonta Adelaide with financial support from SI Mount Gambier. The booklet contains a selection of the stories – giving the writers an opportunity to celebrate their success and be recognised for their courage. We hope that it also inspires and gives confidence to women who believe they can’t leave. Presenting Tony Pasin Federal Member for Barker with a copy of the booklet the idea of bringing Michaelia Cash Federal Minister for Women was conceived and a further collaboration with key service providers led to a major Domestic Violence Forum held on Friday 13 November 2015. Anyone experiencing domestic violence in need of help can contact the Limestone Coast Domestic Violence Service on 87231385 or free call 1800 631 385. Mim was a dedicated teacher who saw the need for student financial assistance in starting training or further study on leaving secondary schooling. Introduced in the 1990s with the intent of providing assistance where financial hardship may have prevented a student from continuing with her chosen career path. After Mim’s death in 1992 the Soroptimist Club named the grant in her honour recognising her commitment to education. Over a 25 year period, through continual fundraising, this remains a local project priority with in excess of $26,000 being offered since its inception. 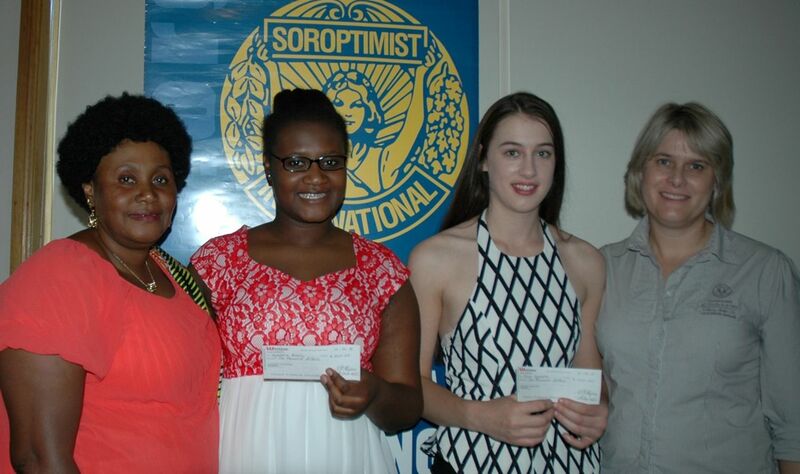 Two young women were recipients of $1,000 each as part of the Soroptimist International Mount Gambier Annual Education Grant awarded in memory of Mim Ingham at their Annual General Meeting on 11 February 2015. read more. pictured are Mother Josephine & daughter Segollene Kasole together with Elena and Corrine Spadotto. On 29 April 2016 a fundraising luncheon was held to launch History Month in Mount Gambier. Working in partnership with the City of Mount Gambier and History SA SI Mount Gambier extended invitations to contributors of the 1986 Mount Gambier Folk Book to provide updates and participate in this major event. In 1985 members undertook a major fundraising project that encouraged local families to provide a written snapshot of their family at that time. Members then went about getting interest from the public, family, friends and associates. Contributors were asked to pay $2.00 for a page of good quality paper and invited to write their story in their own handwriting. The project was very successful with $317 in funds raised which was subsequently donated to support local & global community projects. The stories were varied and interesting and members agreed to arrange for the stories to be professionally bound with a foreword prepared by Don McDonnell, the then Mayor of Mount Gambier. The book was subsequently presented to the Mount Gambier Library to add to its current history collection. Almost 30 years on while Danni Reade of the Mount Gambier library was maintaining the library’s collection she happened upon the book and was delighted to see the names and stories of many people she knew. Danni made contact with our club indicating interest in showcasing this book in some way on its 30th anniversary in 2016. The project has developed from this initial contact with President Margie Russon, a retired university librarian undertaking research at the Mortlake Library reading archived club minutes to ascertain how the project originally unfolded. Stay tuned for more exciting news as this project unfolds. 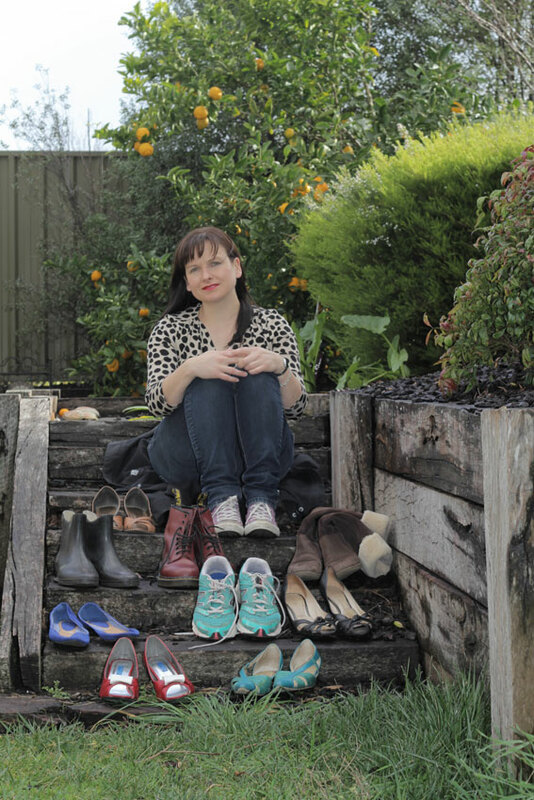 In 2015 SI Mount Gambier received recognition for Walk in My Shoes with a Best Practice Award. Region President Di Potter addressed members at their recent social meeting highlighting the importance of recruiting and retaining new members. At this special meeting members were thanked for their contribution to Walk in My Shoes with the presentation of a Best Practice Award. 170 people attended our recent fundraising event at the Oatmill Cinema on Thursday 24 October 2015 with over $1500 raised for local and international projects. This capped off a highly successful year of fundraising for members with over $13,000 raised making it our best year ever. Well done to Gail Watson and her team. In June 2015 members attended a special training night for Girl Guides in Mount Gambier. Many skills were demonstrated from knitting and crocheting. Of particular interest was hairdressing sessions run by our newest member Tanya Reddie – girls were shown the many intricacies of braiding. Next year may see a special Mother & Daughter evening. During June and July interested SI members worked in partnership with key service delivery agencies to host our highly successful program to disadvantaged youth. Over the course of 6 weeks students under the care of the Guardianship Board were exposed to information relevant to everyday living. This training also included the preparation and sharing of an evening meal with members developing a strong rapport with the young participants.